The black visage of the Taliban was waved to India again today as the terrorist outfit jumped their own deadline and killed their captive K. Suryanarayan, the second Indian worker to be killed in Afghanistan in less than six months. The brutal killing of the kidnapped Indian has thrown up a new foreign policy and security challenge for New Delhi and engaged the attention of the UPA government at the highest level. The family of K. Suryanarayan has been numbed by the news of his killing. His shocked wife Manjula fainted on hearing about her husband’s death. Should the drive against pirated audio and video CDs be more aggressive? 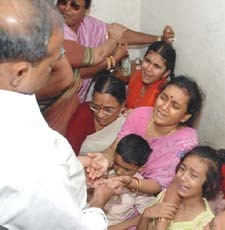 Manjula Narayan (centre) is consoled by Chief Minister of Andhra Pradesh Y.S. Rajashekar Reddy as she grieves with family members at her home in Hyderabad on Sunday after hearing the news that the body of her husband Suryanarayan has been found in Afghanistan. Nine women were killed and 17 persons injured when their canter collided with an oil tanker on the Delhi-Hisar national highway on the outskirts of the city in the wee hours this morning. India and three other Asian countries today won the bid to host the 2011 Cricket World Cup after defeating a joint proposal by Australia and New Zealand at the ICC’s Executive Board meeting here. Four members of a family belonging to a minority community were massacred by terrorists at Lolan-Gala near Basantgarh in Udhampur district today. Union Minister for HRD, Arjun Singh on Sunday trained his guns on the Rashtriya Swayamsevak Sangh (RSS) in a bid to deflect attention from himself and the controversy surrounding his utterances on the reservation for OBCs. A young artillery officer from the city, Capt Sumit Kohli, was killed in an ambush in Pulwama district of Jammu and Kashmir today. Has Shatabdi lost speed and sheen? Introduced as a train of the new generation for comfortable and fast inter-city travel, Shatabdi Express, has lost both its speed and sheen since its introduction 17 years ago. Though the one-way fare in chair car on Chandigarh-Delhi sector has increased from Rs 110 to Rs 500 (454 per cent increase), this super-fast train now takes 20 minutes longer to reach its destination than it used to when it started.